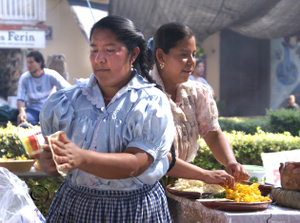 The Purhépecha woman in the foreground pats out tortillas while her companion sorts through a plate of golden, freshly cut flor de calabaza (squash blossoms). The first two mornings of the huge annual artisans' crafts fair in Michoacán begin with a food fair: la Muestra de Gastronomía. Fifteen or so outdoor kitchens, set up around a charming plaza just a block from the crafts booths, offer cooking demonstrations and inexpensive meals of representative Purhépecha dishes. The food, rustic and rarely seen outside a Purhépecha home kitchen, is, in a word, heavenly. The Mexico Cooks! group trooped into the food fair just in time for Saturday breakfast. They could have known who we were by the way our mouths were watering with anticipation. Corn is the basis for the indigenous Mexican kitchen, and the tortilla is the lowest common denominator. On the table in front of this woman, you can see the metate (three-legged rectangular grinding stone) and the mano (similar to a rolling pin) resting on it, along with the prepared masa from which tortillas are made. Both the metate and the mano are hand-carved from volcanic rock. 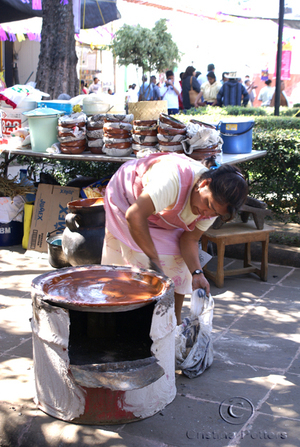 To your left of the table is the clay comal (similar to a griddle) that in this instance rests loosely on top of a metal drum in which the wood cook fire is built. Prior to use, the comal is cured with cal (builders' lime). The cal serves two purposes: it gives the comal a non-stick surface and it adds nutrients to the masa as it toasts. In the past, all of Mexico's women prepared dried corn for masa by soaking and simmering it in a solution of water and cal. The name of the prepared corn is nixtamal. Once it's processed, it's ready to be ground into masa for tortillas, tamales, and other corn-dough preparations. 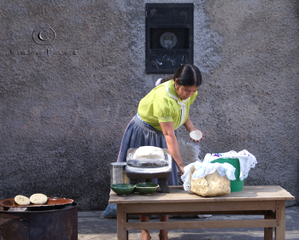 Some rural women still grind nixtamal-ized corn by hand using the metate and mano. 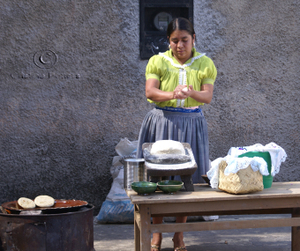 Some take the prepared corn to their neighborhood tortillería (tortilla vendor's shop) for grinding, and some prepare their masa using commercial dried corn flour. In urban areas, the majority of Mexican families buy tortillas hot off the tortilla baker at the tortillería and carry them home, wrapped in a special towel, just in time for a meal. This woman prepares her stove, made of part of a metal drum with an opening cut away for firewood. She's spreading a paste made of wood ash and cal on and around the top of the the drum to hold the comal in place. The white streaks on the red clay comal are cal. The volcanic rock metate and mano are on the bench in the background. Her well-used clay cooking pot is visible to your left. This joyous woman is patting out blue corn tortillas. The masa and mano are on the metate in front of her. She's toasting the tortillas and roasting tomatoes and chiles on her clay comal. The comal is set into a clay stove fired by wood. The haze that you see is woodsmoke. 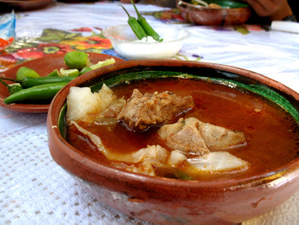 The Purhépecha kitchen repertoire includes numerous atápakuas (literally, a type of thick, soup-like salsa served plentifully over prepared food). The Purhépecha word atápakua has meaning deeper than its simple definition. Its connotation is food that is picante (spicy), nutritious, and life-sustaining in a spiritual sense. Mexican culinary historians agree that the preparation of atápakuas dates from as long as 400 years before the Spanish Conquest, around 1100 AD, when the Purhépecha were strong rulers in the area of Mexico that is now Michoacán. 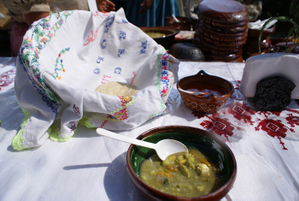 An atápakua can be made from the ingredients that are easily found in the region. The specialty of one tiny village of the Meseta Purhépecha is atápakua del talpanal (wasp larvae). 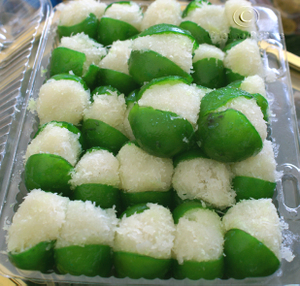 Another town's specialty is xururi atápakua, the principal ingredient of which is cotton seeds. More commonly, indigenous cooks prepare their atápakuas of seasonal and readily available vegetables along with a bit of meat, poultry, or fish. We of Mexico Cooks! didn't eat wasp larvae or cotton seeds. We inhaled bowls of atápakua de flor de calabaza (thick, soupy salsa served over squash flowers, fresh corn kernels, and chunks of corundas de ceniza (unfilled tamales made with masa and wood ash). In the closeup of the atápakua you can clearly see the corn kernels (closest to the bowl of the spoon), small pieces of calabacita (similar to zucchini), orange squash flowers, and a piece of white corunda. For flavor and color, chiles serrano and cilantro are blended into the cooking liquid. The thin, soupy salsa is then thickened by blending a small ball of masa into the hot liquid. This atápakua is deliciously spicy and tastes as fresh as the garden. I finished my portion and wanted another bowl. And here's part of the Mexico Cooks! breakfast crew. We had already gobbled our atápakua (witness the empty bowls) and had moved on to snarfing down the jahuácatas we're holding. Jahuácatas are similar to gorditas. 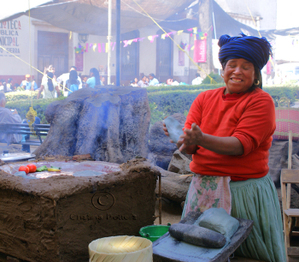 Purhépecha women prepare the jahuácatas by folding freshly patted tortillas and refried beans into multiple thin layers, then toasting the finished product on the comal. Churipo, shown above, is one of my favorite Purhépecha specialties. 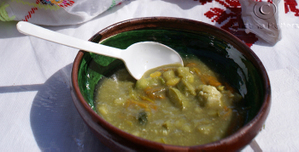 Churipo is a hearty soup, the delicious broth flavored by long cooking with beef, cabbage, calabacitas, xoconostle (the sour fruit of a specific nopal cactus), onion, chile, and other ingredients. Served with a squeeze of limón (Mexican lime), a sprinkle of coarse sea salt, tortillas hot off the comal and corundas de ceniza broken up in the bowl, it's a wonderful meal in one dish. If your palate will take the heat, eat some raw chiles serrano along with your bowl of churipo. Remember that the tip of any chile is less picante than the stem end, where most of the seeds are. Late in the afternoon, after we'd investigated as many of the crafts booths as we could, we were all in need of something very light and fresh for our comida (middday meal). We ordered a fruit plate and a plate of guacamole with totopos (triangular fried tortilla chips) at a local restaurant. For dessert we found limones, with the pulp scraped away, candied and stuffed with cocada (coconut candy). Half of one of these is plenty! This was such a sweet finish to a fascinating day in Michoacán. 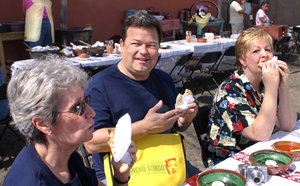 If you'd like to travel to this event in 2008, be sure to email Mexico Cooks! in time to save your place for adventure. I recently bought a clay comal in Guatemala. I coated it with a slurry of cal and let it sit for a few weeks. An Indigenous woman in a market told me to wash the cal off of the comal before cooking tortillas on it. I followed her directions, but the corn tortillas stuck to the comal. Do you have any suggestions for future preparation of the comal for cooking tortillas? I'm looking for a clay comal for my restaurant (34").Can you direct me? Hi Carlos, and thanks for your question. The best place to buy a clay comal is--you guessed it--in Mexico. I haven't seen any quite as big as 34", but you can always ask to have one specially made to your specifications. If it were me, I'd buy two or three. They're very light and very breakable, so one or two extra would give you backup at the restaurant, just in case.